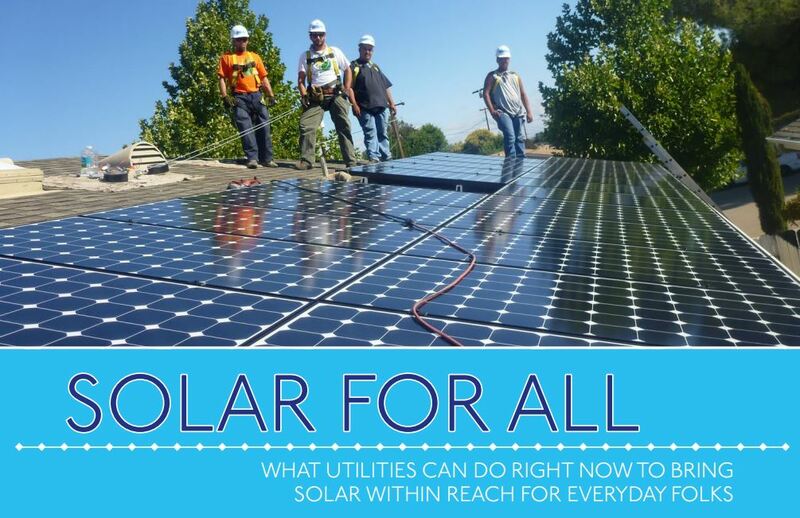 utilities Archives - Solar Love! Rooftop solar is great, in theory. Instead of letting sunlight that is hitting our roofs do nothing more than heat up our shingles, a rooftop solar system can take that same solar energy and use it to generate electricity. 20 years ago, solar panels were prohibitively expensive, but new technology and manufacturing techniques soon slashed the cost. Even still, the cost of a rooftop solar system was large enough that creative financing models were needed to pay for them. Conventional lenders were skeptical of the new systems and refused to lend money to finance them. 5 years ago, companies like SolarCity devised leasing programs to make rooftop solar accessible to more families. Recently, no-money-down purchase options have become available. But barriers still remained. People who wanted a rooftop solar system still had to navigate a permitting process that could be confusing and arbitrary. Leases and purchase agreements often interfered with the ability to sell a home without a lot of extra legal expense and hassle. Many conventional, investor-owned utility companies have resisted the wave of new rooftop solar systems, claiming they would destabilize the electrical grid. In reality, however, they are more afraid of losing customers and therefore revenue than anything else. Their response to rooftop solar has been to punish homeowners who installed solar panels on their homes with burdensome monthly surcharges. There are relatively few municipal utility companies in America, but those that do exist look at the market for electricity differently than investor-owned utilities. The municipal systems follow a much more service-oriented approach that does not need to satisfy bond holders. Notably, when it comes to crowdfunding solar power, the Rocky Mountain Institute pointed out the important fact that there’s safety in numbers. One key benefit of community solar to which I hadn’t really given much thought was that this model often makes going solar very easy. Frankly, I thought going solar was pretty easy anyway, but I guess that extra bit of ease really can make a difference for many people. Related to that, making community solar options as simple as possible was focused on by some people as an important best practice. This also seems to be something that UK renewable energy utility Ecotricity has discovered. Another point that I found particularly noteworthy was that schools and nonprofits bring positive associations to solar — as such, a great goal is to get more of these community leaders to go solar. Of course, solar brings many benefits to consumers, and community solar especially so. We need to make this more well known. Obviously, I think that’s important — that’s what I’m in the business of doing! SolarRosana was also great to point out that Vote Solar is a great resource that can help us to support community solar and get it going in our communities. SolarRosana and The Community Power Report also shared resources focused on sharing community solar examples from around the world. Of course, one of the biggest keys to advancing community solar is simply getting more community solar legislation put into place. We talk a lot about independence and freedom in this society, and we highlight these as two of the great values of American culture. Our ancestors fought hard to provide us with the independence and freedom that we have today. But I know I’m not the only one who wonders these days if we haven’t lost sense of that ideal a bit. We tie ourselves to systems and contracts that make us financial slaves to so many things. One thing that many of us are slaves to is high electric bills. We assume it’s just a fact of life, that we have to send a good chunk of our monthly salaries to electric monopolies and we can’t do much to avoid their rising prices. But we don’t have to do this, and we can avoid those rising prices. You can drop that monthly nightmare — you can “emancipate yourself from electric slavery” … by deciding to go solar and get your electricity from the largest energy source in the galaxy! … er, solar system! Have you thought about it before, checked the price of doing so, and decided that it was too expensive a switch? Well, if you did that awhile back, it’s definitely time to check again. The cost of solar has fallen through the floor in the past few years. It has actually fallen a lot just within the past few months. Solar panel prices have fallen enough that it would be insane for many of us to keep sending our money to polluting power plants and money-hungry utilities. Don’t sit back in your chair or on your couch and leave yourself shackled to electricity systems of the past. Lean forward, dig in with all your strength (that is, click a few buttons), and see how much money you could save by switching to solar power. That’s part of a recent Cost of Solar article that I think every adult in the US should read. For more on that topic (including more info on the Bob Marley allusion in the fourth paragraph) check out the full article at the link above. 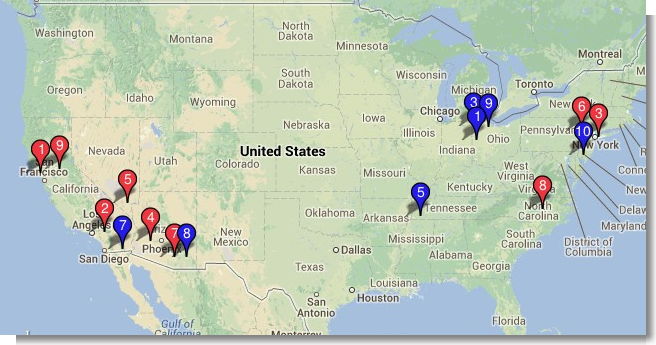 The Solar Electric Power Association (SEPA) recently released its latest SEPA Utility Solar Rankings. Of course, there are different ways to rank a utility on its solar merits, so we’re including SEPA’s main two lists/rankings below. First, however, a note from our sponsors…. Our sponsors, in all honesty, are you, common citizens and clean energy advocates. Our focus is on bringing more cleantech to the world so that we can combat global warming and avoid its worst effects… as well as other types of societal harm from dirty tech. The note I wanted to make is that, yes, some utilities are doing more to be good “citizens” and reduce their carbon dioxide contribution. However, for the most part, the utility network and engrained utility models are having a hard time coming to grips with the fact that the grid is changing and distributed renewable energy is the future… and the future is now. There are a plethora of articles all about these matters, some of which are quite demonizing. And the demonization is quite warranted in many cases. However, it is also worth noting that some utilities are making notable strides forward (either against their will or voluntarily). So, with my brief contextual note out of the way, let’s go ahead and drool over not one but two Top 10 lists.